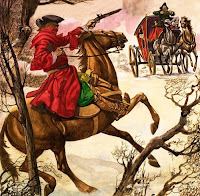 In my newfound interest in perfume oil blends, I scored a sample of this fragrance, called The Highwayman, from an artisan online perfume merchant called Alkemia. Their website is very cool (the picture on the right is from their website), with lots of dark, occult paintings and imagery, and descriptions of their fragrances that would make even the most cynical perfume grouch want to whip out a credit card. It's an awesome website, and is totally unique and unpretentious; it seems to be geared more towards women than men, but I still dig it. Apparently Alkemia make their own pure oil perfumes, and I recently ordered six samples of their fragrances. The Highwayman is the first one I've worn, and it's a good one. Here we have another very interesting and unique take on leather. Like Cuir Ottoman, The Highwayman smells transparent, not heavy, which is unusual for a leather scent. What I like about this is that it has no sweetness whatsoever, so what you have is a very dry leather, with a touch of herbal and wood notes in the background to add a little bit of color to the scent. Alkemia describes this scent as being for a gentleman and a bad-boy, containing the smells of leather, nighttime air, moss, smoke, gunpowder, etc.. I can't say I smell all of that in here, but no matter. This is still an excellent dark, dry and very austere leather-dominant scent, with a crispness you rarely smell in a leather scent, and which does give this fragrance a smell like air on a cold autumn night. As my skin absorbs the oils and the scent evolves, I can smell in the background a light scent of burnt cinders, which makes the fragrance smell very dark. Many fragrances overdo the whole burnt/smoke smell (e.g., Kolnisch Juchten, Etro's Vetiver), which can make a cologne smell like barbecue sauce. In The Highwayman, the cinder smell is very subtle and perfectly balanced with the other notes, rather than fighting with them. The Highwayman is light and discreet, mainly because it is so dry, but it's not at all a timid or wimpy scent. It definitely smells masculine, but of gentlemanly masculinity, not really of the "bad boy" persuasion. Many thanks to OlfactoryObsessed for leading me on to Alkemia. I can't believe I missed this! I'm so glad you like Alkemia Perfumes! I haven't tried Highwayman, I will order a sample pronto as I love leather fragrances. Maybe I'll turn my husband into a perfume oil convert. 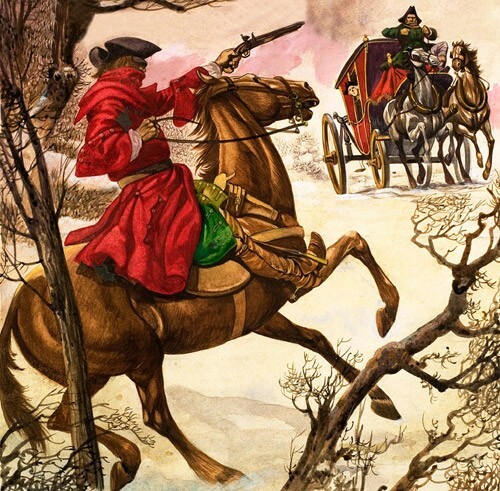 Highwayman is great. I also liked Hippie Gypsy, which I reviewed here too. Alkemia's perfumes are truly unique and excellent. I bought a bottle of Lacivius, which is also excellent and which I plan to write a review on too.